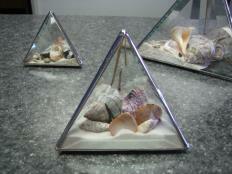 - High Quality Beveled Glass, sealed and lead soldered. Seam is smooth and shiny. Absolutely every seashell was once a home to a living creature. I would NEVER put out, kill or harm an animal to make a profit. Please be an educated consumer and protect our sea creatures. Thank you. 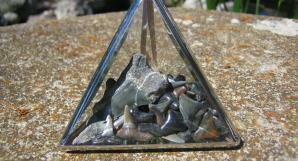 Sharks Teeth 3" Pyramid contains approximately 75 sharks teeth. 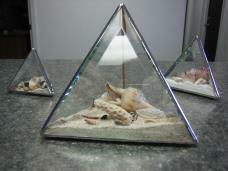 Beachscape Ornament 2" Pyramid contains a sharks tooth, miscellaneous shells and Siesta Key sand. 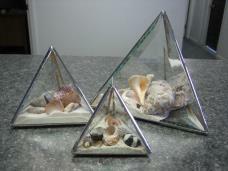 - Thank you so much for the personal service and whimsical sandscape pyramid. The gift arrived a day earlier than expected, and certainly met my expectations. I gave it to my friend today, and she was delighted. She was especially impressed with your practice of using found shells and not harvesting shells with live creatures or getting shells from questionable sources. 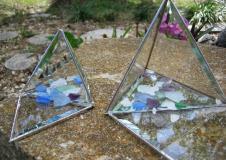 I am sure I will order from you again, probably sending some of my beach finds from years gone by. 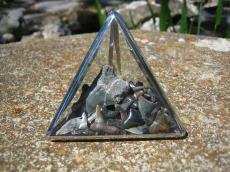 - Lovely, lovely pyramid box... just shines. Even better than the picture. Thank you very much for the great service. 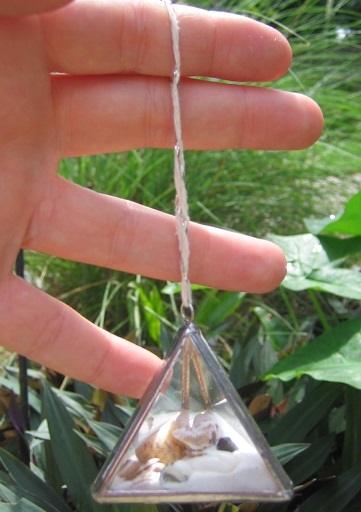 - Beautiful handmade glass box. Looks amazing. Great price. Thanks! - Great attention to details, wonderful product!